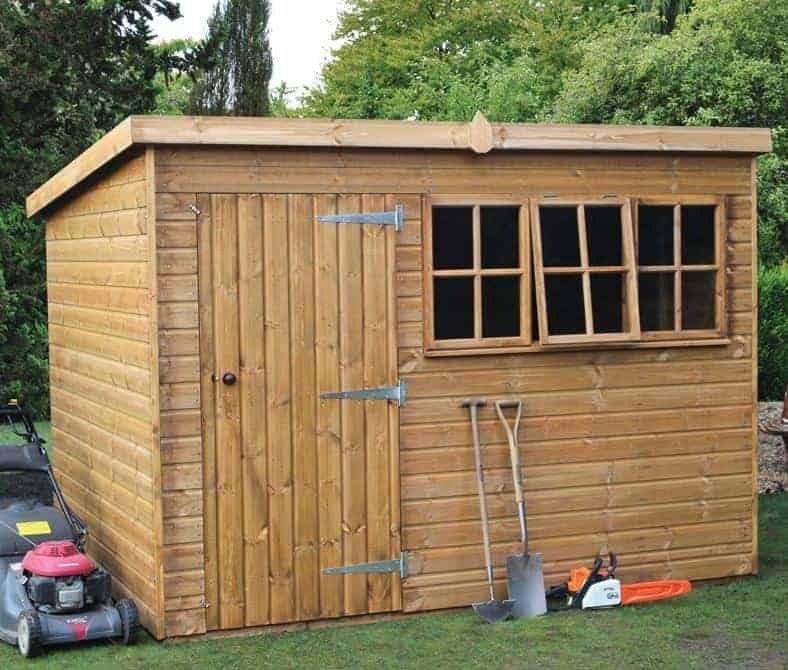 This usefully sized storage shed replicates the traditional look that has graced our gardens for decades, and yet it uses the latest planed all round tongue and groove cladding. 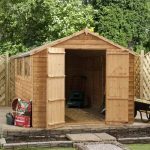 This means that it’s very tough for a shed that’s light and easy to construct, and when allied to the heavy duty framing it’s also very stable so it’s a good choice if your garden is often subject to windy conditions. We were pleased to see such high quality cladding used, especially as it’s used across all the surfaces and not only the walls. It also means that rain will be effectively kept out, a process that’s also helped by the pitch of the pent roof from which water or snow simply slides off. For this reason it should be good at resisting rot, although it’s a pity the manufacturer’s warranty doesn’t reflect this. You’ll also want to protect your good from potential thieves, as well as the elements, of course, so it’s good to see that a strong key operated lock has been included as standard. It brings added peace of mind, especially as security is also enhanced by the tough glazing on the three windows, two of which are fixed and one opening. We liked this shed’s traditional good looks from the moment we saw it, and yet it surpasses standard rustic sheds by having a smooth planed and elegant appearance rather than typical rough sawn sheds complete with splinters. 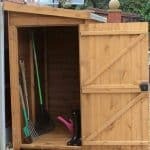 If a shed’s appearance is one of the most important factors to you, then this is sure to score highly. One of the traditional features is the pent roof, which is an effective way to carry water away without looking too obtrusive like some apex roofs can do. Unlike some pent sheds we review, it was good to see that vertical storage space hadn’t been compromised thanks to a ridge height of 1.99m and an eaves height of 1.75m. Also take note of the overall width, 2.44m, and the overall depth of 3.05m as you’ll need these dimensions plus at least a foot on each side, to make retreatment easier, on which to site the shed. 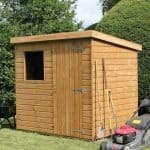 Once assembled this is one of the strongest feeling and most stable wooden sheds we’ve reviewed, and that’s largely due to the heavy duty frame. At 44 X 44mm, it’s noticeably thicker than most frames we see, and the tongue and groove cladding itself, whilst a standard 12mm, is given added toughness as its planed all round rather than being rough sawn. We were pleased that the floor was made of the same shiplap cladding as the walls, which would ordinarily give it a good level of protection against moisture. This could potentially be compromised, however, as the floor is not raised above ground level by floor joists. This puts in contact with the excessive moisture typically found on the ground, so we highly recommend buying the optional floor bearers to combat this. With a shed costing approximately a thousand pounds, we would like to see a long lasting preservative treatment being applied. We were disappointed, further, to find that a basic dip treatment of one coat of preservative is all that’s been applied prior to delivery. That’s why the customer has to apply a treatment of their own after six weeks, and again on a yearly basis. 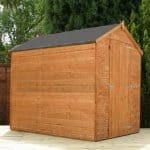 It’s also one reason why this shed only comes with a one year warranty, even though the combination of tongue and groove cladding with a pent roof should allow for a much longer rot free period. There are two things we like most about this single hinged door: one is that the position is interchangeable, and the other is its generous dimensions. It has a width of 0.76m and a height of 1.75m, which makes it more accommodating than many single doors we say, ensuring that moving objects of any size or shape in and out is easy. We were also pleased with the windows. There are three included, which means that there is enough natural light inside the shed to work on a hobby. It was good to see that one of the windows is opening, as opposed to fixed, this aiding ventilation. If required, there is the option to convert one of the fixed windows to an opening window, although this costs an extra £31.99. The windows light up the shed’s interior, but they could also potentially be a security risk, which is why we welcomed the use of tough and shatter resistant horticultural glass. There’s even the option to have a fully boarded window free design for customers who are planning on storing valuable items, which we feel is a good touch. Security is further enhanced by the inclusion of a key operated lock on the door, which is something we always look for but don’t always find on garden buildings. We were pleased to see that there are lots of ways for the customer to personalise their shed, so that it fits in with their particular garden layout. One of the options is to change the siting of the door to one of three positions, and this can also have an effect upon where the windows are situated. If required, the door itself can also be upgraded to a double door that opens to a width of five feet. People have increasingly busy lives, so it was good to see that the manufacturers had catered for people with hectic lifestyles by offering a professional installation service. For a cost of £159.99, assembly can be left in expert hands. We were very impressed by the quality of components used across this shed, from the PAR cladding to the chamfered edges on the frame. The cladding should be very rain resistant, but durability is let down somewhat by the basic preservation process used and the lack of floor joists. This is a mid sized garden shed, but thanks to its taller than average eaves height it’s possible to fit more inside than we first thought. As always with timber sheds, it’s important to read the instructions thoroughly before commencing installation, but once this is done, and with a friend’s help, you should be able to complete the assembly in around five hours. For its price tag we were disappointed at the lack of an extended warranty, amongst other things, but it does still boast some very useful features. 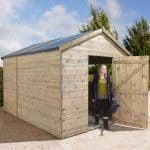 Final Thoughts: With our climate seemingly becoming ever wetter and windier it’s essential that a wooden shed is tough enough to withstand the weathering. We don’t have any qualms about this tough shed, thanks to its high quality cladding and heavy duty frame, as long as floor joists are installed to lift it above ground level and as long as the retreatment program is adhered to. These both add to the initial expense of a shed which already costs more than many of a similar size. Its good looks, three tough windows, and integrated locking system will, we feel, still make it worthy of consideration by those whose budgets stretch to over a thousand pounds.